Our wedding invitations had been a hit. 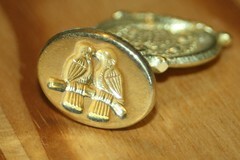 The only complaint I’d overheard was that it broke people’s hearts to break that delicate wax seal. 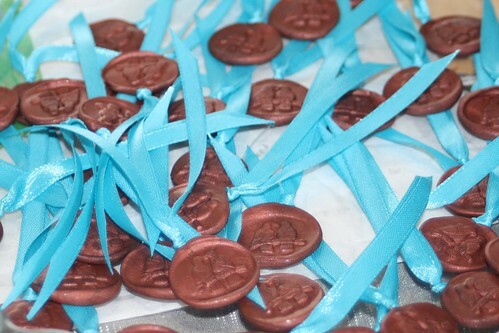 The more that people mentioned this problem, the more I started to think about ways to make more permanent versions of the seal which they could use long after the wedding. 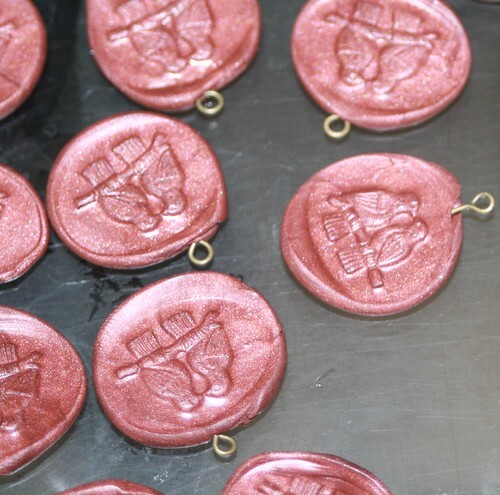 I’ve always loved working with polymer clay and I thought to myself how easy it would be to make clay versions of the wax seals so long as I used fresh clay and conditioned it enough to take the impression. I ordered a package of Sculpey’s Premo Effects Bronze clay and found that it was enough for 38 seals. 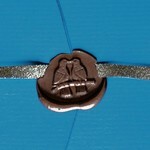 I used the lovebirds seal and the blue ribbons which were left over from the wedding. The first step was to form the eyepins so that they would remain solidly placed in the polymer clay after baking. I cut the pins in half with my wire cutters. 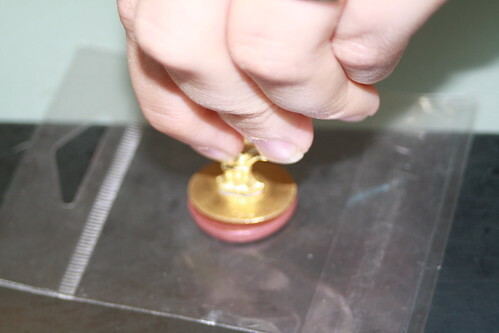 Formed an eye on the straight half, and used my needle nose pliers to bend and loop the wire around so that the total length was less than the height of my wax seal. I did this to all the eyepins and then set them aside to await the next step. I experimented a bit to find the right amount of clay to make the impression into and found that a one centimeter ball seemed to work perfectly. 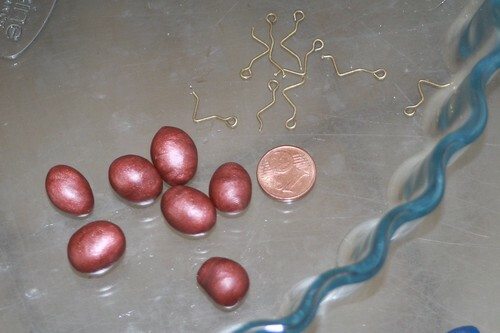 I rolled an entire package of the bronze sculpey into these little balls and set them aside. This helped to pre-condition the clay so I wouldn’t have to work it so much for the next step. I poked a loopy eyepin into a ball of clay and then set it down onto a sheet of thick but flexible plastic. 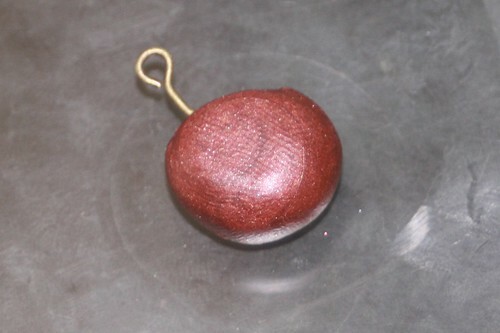 Holding onto the eyepin with one hand, I gently flattened the ball of clay with the wax seal. I was surprised by how well it turned out. There were only a few of these that I had to take apart and try again. I followed the instructions on the package closely and baked my seals at 275 °F (130 °C) for 30 minutes in a glass pie pan. I actually ended up taking them out around the 27 minute mark when I noticed that one was starting to look a bit burnt. After the seals had cooled down, I used my wireworking tools to make sure that all the eyes were tightly closed. 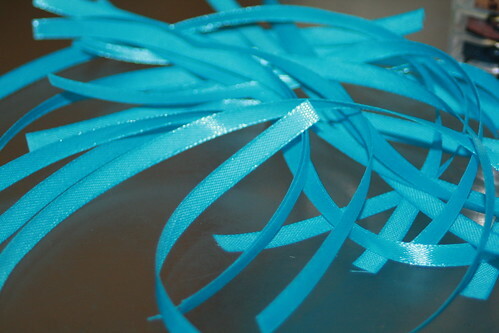 I used a piece of cardstock to make my ribbons all the same length. This is as simple as wrapping the ribbon around the cardstock once for each bookmark and then cutting through one edge of the wrapping. I poked the middle of a length of ribbon through the eye (from front to back) and pulled the ends through the loop to form a tight little knot around the eye of the pin. I cut the ends of the ribbon to an angle. All finished! 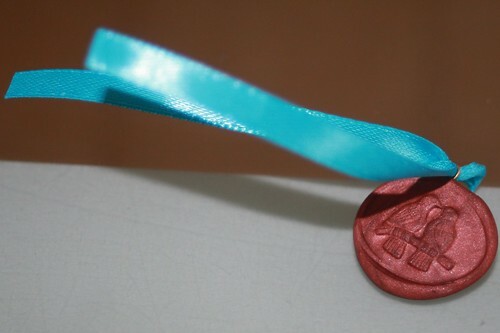 You are not required to make bookmarks out of your seals. 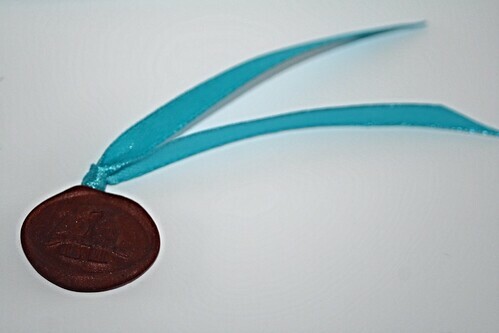 You can use them as pendants for jewelry, gift tag embellishments, brand labels. The sky is the limit! Of course, I couldn’t just send the bookmarks as they were, I needed to create some Thank-you cards to hold them. That walk-through can be found here.